This is an initiative supported by the Department of Education & Skills, based in Mayo Education Centre. Once awarded this flag is valid for 3 years. This initiative wishes to recognise schools that strive to achieve a physically educated, physically active school community by awarding them the Active School Flag. We recognise and promote the importance of an active, healthy lifestyle, organising various initiatives to give the pupils an opportunity of getting active. We offer a wide and varied approach to physical activity, both indoor & outdoor, through P.E. and also through lunchtime and after school activities. Sport and physical activity have always been central to life in Gaelscoil Bhríde but since embarking on a journey to secure our Active School Flag we have brought this to a new level with many very worthwhile initiatives being introduced. The benefits of this are clear to be seen with our pupils engaging with many new and different activities. We have a fantastic, enthusiastic committee of 12 pupils, 2 from every class from Rang 1 to Rang 6 along with our Múinteoirí aclaí! This committee meets to plan engaging, physical activities for the whole school, throughout the school year. This great bunch help put a plan together to get everybody active! We have a superb team of Active Leaders from the senior classes. This team changes throughout the year and new leaders take over. Their role is one of support and encouragement, leading the younger pupils in various activities at break time and lunchtime. This has proven to be one of the most fruitful of our “active” initiatives, with both senior and junior pupils, not only benefiting physically but also socially, where the interaction between both groups has been a joy to behold. This team has led sessions in ball skills, fundamental movement, scavenger hunts, orienteering, Rith timpeall na hEorapa’ “Aoine Aclaí”, to name but a few! This is a firm favourite with our pupils with a full week of fun outdoor and indoor activities along with a week of physical homework – not a single word to be written! Below is a sample timetable from our Active Week last year. This is a big hit! Wednesday nights, the school bags are left to one side and it’s time to grab the dog, the bike, the ball, the hurley, the music …. And get moving! We encourage all pupils to spend 45 – 60 minutes doing something fun and active. 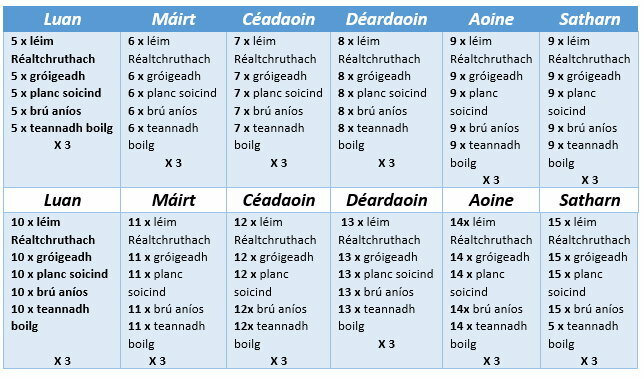 Parents must sign off on this activity in the “Dialann Obairbhaile”. Fridays have just gotten a whole lot better! What better way to kick start the weekends with a Fun-filled Friday. Skipping, Obstacle Courses, Bean Scarves, Scavenger Hunts, Unihac, Buail amach, Circuits, Orienteering, Fun Run, Tug 0 War …. The list goes on. A great way to kick start the year! Get moving early, clocking up the kilometres, visiting the cities and the major landmarks of Europe. Every lap equals 1 km, the more we run, the further we travel … Big Ben, Eiffel Tower, Leaning Tower of Pisa, Lake Bled … We visited lots of interesting places, not only increasing our fitness and wellbeing, but learning lots also! We have participated in both ‘The Tour of Europe’ and ‘Running around Europe’ initiatives. Thanks to the lovely signs we received from “Get Ireland Walking” we have a great walkway on our own school grounds. Junior classes walk this at small break (1 1/2 – 2km) and the senior classes walk/run it at lunch break, with many of our pupils covering 5km. Our Múinteoirí join in also. Not sure how many of them surpass 5km!! We have held Skipping Workshops in our school over the last couple of years. “Skipping for Life” and “Skip ‘n Rope”, both of which have been a huge success. The interest it has fuelled in skipping in our school has been phenomenal with all pupils from Junior Infant girls to Sixth class boys been bitten by the bug! To see where we all started, day 1 of Workshop 1 and how we have progressed from “Flailing Windmills” to ever so polite “dinner ladies” has been amazing to watch. Pupils and the school invested in ropes and both individuals and groups fill the yard on skipping days. Street Ropes and associated games have been a massive hit! As regards physical activity, it’s undoubtedly one of the best and so inclusive! Tuesdays and Wednesdays are “Smart Moves” days and everybody looks forward to having lots of fun! All together Running on the spot, getting faster, lifting knees up. Traffic Lights, Jumping Jacks, Windmills, Aeroplanes, Animal Walks. Press the palms of the hands into the floor and straighten the arms and to keep the upper body as long and straight as possible; Tighten the body for five seconds, holding this position, i.e. a half press-up position. 3. High Jinx Jumps The children walk to a bucket with a bean bag on their foot & drop the bean bag into the bucket without using their hands. Stretch the ropes out to make a straight line. The children are pretending to be acrobats. Start with walking forwards being careful not to fall off as there are no safety nets. Children stand along a bench as if they are skydivers. They must jump out of the plane onto a mat. Children in pairs. The ‘trailer’ holding waist of ‘truck’. Trucks weave in & out through the cones while trailer follows & must stay attached. 2.Balloon Tennis Children must keep their balloon off the ground while using all body parts to do so. All together Marching, Stretching – arm stretch, direction stretch, finger stretch, back stretch, long stretch, cat pose, funny faces. For 4 consecutive weeks, each class has committed to undertaking this Active Challenge, which we completed in November of this school year. This involves an active break every day, for a month. This break may be running, dancing or any other form of activity. This is then recorded on a classroom chart, which is displayed in the classroom. The Active School Committee members are responsible for ensuring its implementation in each room. High intensity training session takes place in the school hall at lunch time. Pupils work hard, pushing themselves through various exercises, as background music keeps things upbeat! Hard work but great fun! Phew……cá bhfuil mo bhuidéal uisce?! Sessions run at am lóin, Tuesday, Wednesday and Thursday! Just a flavour of some of our fun exercises to prepare for the yummy treats of the festive season! A great way to kick start the New Year! All pupils were given a copy of this timetable to be incorporated into their nightly homework. Not as easy it might look! We aim to push ourselves a little further every day! This little gem has been the latest addition to our school activities menu! 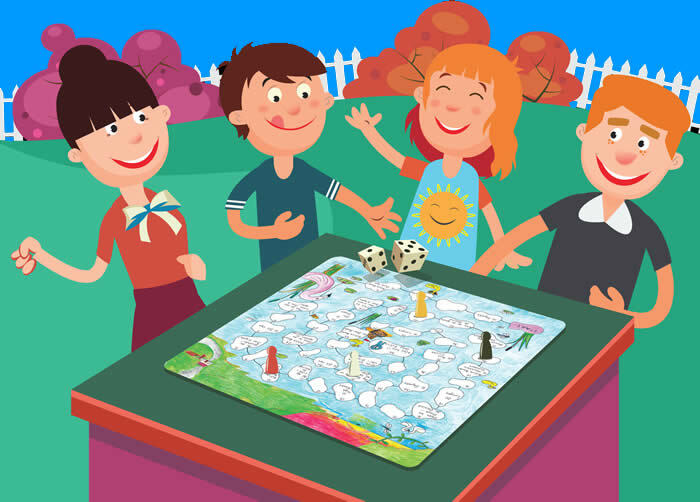 This bilingual, active board game has been devised by our fifth class pupils as part of their involvement in the Junior Entrepreneur Programme. Many of these pupils are part of our cohort of Playground leaders and are very aware of our efforts to increase activity levels in the school through fun initiatives. This game has it all! It ticks many boxes! It can be played by individuals or in teams, at home or in class, enjoyed by all ages! No thank you, not for us! Raining outside? What will we do? Take out our game, play ‘Get up and Go’! We are lucky that our school has strong connections with local sports organisations such as the local G.A.A. clubs, Durlas Óg, Thurles Sarsfields and Thurles Gaels, Peake Villa Soccer club and Athletics. We are also affiliated to North Tipperary Sports Partnership who support the development of games and sport in our community. We are very lucky to have such strong links with the local G.A.A. 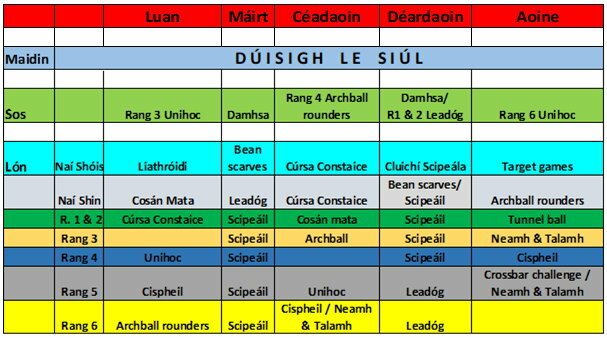 clubs, where a coach supports the development of skills in our Gaelic Games from Junior Infants to Rang 6, in hurling, camogie, football and ladies football. The F.A.I. also provides soccer coaching to various classes. We have links with Athletics Clubs also, who help support our work in developing skills in this area, through providing training sessions for both staff & pupils. We have also signed an agreement with the newly formed Tennis Club and look forward to working with them when their new facilities are up and running.